Executive producer: Jacques Fred Petrus for little macho production Co., Inc. The band Even though the persons on the front and back covers on the album weren't stated as "The band" they have to be seen in that way. Despite Kevin Nance being one of them, he's surprisingly not even mentioned on the cover which is a bit strange. But on the other hand this perhaps shows that the band identity was still very loosely put together due to the other engagements and Petrus will. 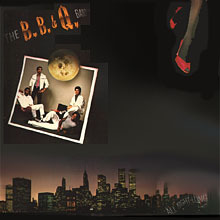 Recorded at Media studios, New York, N. Y.